At Better Properties Kitsap we are focused on showing our current and future clients what Kitsap County has to offer in regards to home prices, community, and activities. This is precisely why we have the Tour de Kitsap. It highlights what is amazing about Kitsap County and lets individuals who are being froze out of the Seattle housing market see it is A Better Option. According to Zillow the median home price in King County is $608,000, where as in Kitsap County it is $339,400. That means you can get a lot more home for your money in Kitsap County. On our Tour de Kitsap event on March 17th, 2018 we will be featuring the Master Plan Community of McCormick. McCormick is a Master Plan Community that surrounds an 18-hole golf course. It is a short ferry ride from Seattle by either traditional ferry or the new walk on fast ferry. The fast ferry only takes 30 minutes to get from Bremerton to downtown Seattle. In the next couple years there will be a fast ferry from Southworth and Kingston to downtown Seattle that will add to commuting options. Gone are the days of fighting traffic to get to Seattle. McCormick currently has four of Puget Sound’s finest homebuilders building luxury homes in their community right now. All offer various features and uniqueness. The Port Orchard Chamber of Commerce states that McCormick is a 2400-acre community that has set aside 40% of its property for open spaces and wildlife. This means there are plenty of wooded acres to explore. If you choose to have a house built at McCormick you can choose the builder that would best fit you and be able to choose a lot. You could have a view of the fairway from your back porch or look out at natural wooded beauty. The options are endless. Just because McCormick is a wooded serene community does not mean it is out of the way either. It is minutes from town where you have access to restaurants, grocery stores, medical care, and schools. McCormick is a something for everyone community. McCormick offers many amenities to its residents. First off there is the golf course and clubhouse. They host a variety of events and tournaments to get you out there to socialize and meet your neighbors. They also offer many miles of walking/hiking trails for those wanting to spend time outdoors. There are playgrounds nestled through out the community for the kids or grandkids. If you are interested in sports you have options with the tennis, pickle ball, and basketball courts. Wanting to get involved, look no further, at McCormick they have various clubs such as a gardening club, a ladies book club, and an adult social. Not to mention the different golf clubs available. As previous stated there are four different homebuilders in McCormick at this time. They are Mainvue Homes, Garrette Custom Homes, Zetterburg Custom Homes, and Century Communities. Mainvue Homes is known for its luxury. They offer many standard upgrades, which are included in the price of the home. The homes at Mainvue have a very modern elegant look. There are many different floor plans and façade choices along with 4 different color schemes to choose from. They also just introduced 4 new rambler options. Mainvue homes are a must see during our tour. Garrette Custom homes have a more traditional elegance. They have several floor plans to choose from and many different options. In fact they have so many different options that there is a whole design studio in the Portland/Vancouver area. They will even pay for your hotel room when you go to design your new home. Garrette really focuses on making your home custom. If you join us on our tour you will tour a model and see what Garrette has to offer. You will love these homes. Zetterburg Custom Homes is a local family owned homebuilder. They specialize in rambler style homes. In the McCormick community they offer 7 different floor plans and a variety of options to choose from so you can customize your home to meet your needs. We will check out these beautiful homes on our tour also. Century Custom Homes focus on building the new right homes in the right location. Century is highlighted by refreshingly sophisticated new home designs that fit your PNW life style. We are hosting our tour March 17th from 12-2. We will be showcasing McCormick and touring the models of the four homebuilders discussed. After the tour you will then be treated to a reception with hors d’oeuvres and beverages. Another amenity McCormick offers to its residents is a shuttle to the ferry. The shuttle can pick you up at the Port Orchard ferry dock or meet us at the McCormick woods clubhouse. After the tour we will have a free gift bag and pair of tickets to a St. Patty’s Day show at the Roxy Theater. We specifically wanted to host the tour on St. Patrick’s Day so the guests can see some of the fun activities happening that day. 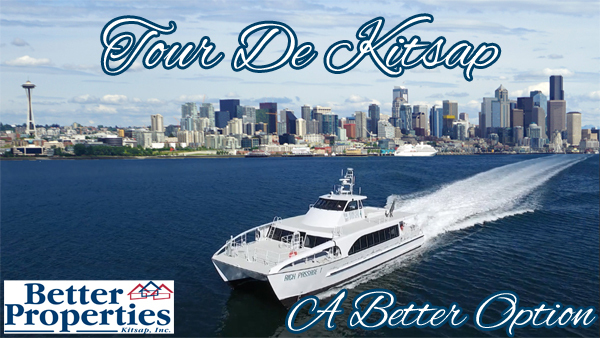 We want you to make a day out of it and come with us to see that Kitsap County and McCormick are A Better Option.